For STIC experience is not just a number - because that simply states how old we are &- but a journey, which comprises all the triumphs and trials, crashes and crescendos, opportunities and threats that we have learnt and risen from. Adapting to changes, both temporary and permanent, has helped us adopt a dynamic existence, wherein “ the present” is in our work, but “the future” is in our minds. At STIC, we believe that success does not come from a single person. It is only when every employee in the organization is empowered and motivated to work towards this belief, can we truly succeed. And in order to do so, we need to build initiative and motivation at every level by constantly enhancing the structure and flow of communication. Keeping this in mind, we would like to present our "Principle of Participative Management", which is not just our philosophy, but the very foundation of our organization and is reflected in our corporate structure. At STIC, we are constantly driven towards adding value to our corporate activities, thereby achieving 100% customer satisfaction. And as a means to do so, we have built an unparalleled physical and virtual network, which helps to penetrate every corner of the Indian Market, and seize valuable opportunities. 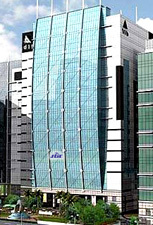 More than 40 offices centrally located across the length and breadth of India. A strong workforce of more than 450 employees. 24-hour connectivity through Phone , Fax, Internet and CRS systems. At STIC, we have developed a keen and critical understanding of dynamics governing the nature of markets. This combined with a vast source of business information has stood us in good stead while reaching out to the far corners of India. STIC is also the recipient of innumerable National and International Awards for Excellence in Sales and Marketing. We have trained and groomed a result-oriented team of professionals, enabling us to achieve or exceed targets set by our various principles. We have received awards from each and every product we have represented in India till date. Outstanding GSA Performance for 10 yrs continues, 1999. Certificate of Achievement, Apr. 2001. Certificate of Achievement (BOM), 2004. Top Agent - Gold Passengers, 1998. Top Agent - Gold Passengers, 1999. Prospecting and Promising GSA, 2005. Golden Performance Award India, 1988-1989. Golden Performance Award India, 1989-1990. Golden Performance Award India, 1991-1992. Golden Performance Award MAA, 1987-1988. Golden Performance Award MAA, 1992-1993. Golden Performance Award MAA, 1993-1994. Golden Performance Award MAA, 1994-1995. Golden Performance Award MAA, 1995-1996. 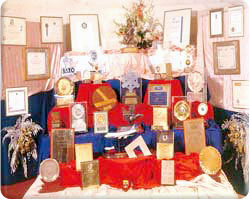 Golden Performance Award MAA, 1998-1999. Top Agent Award in recognition of outstanding achievements, 1983-1984. Gold Award (Top Agent Award), 1990-1991. Top Agent Award (BOM), 1991-1992. Top Agent Award (MAA), 1995-1996. Top Agent Award (MAA), 1996-1997. Top Agent Award (MAA), 1997-1998. Top Agent Award (MAA), 1998-1999. Top Agent Award (MAA), 1999-2000. Top Passenger Merit Award (MAA), Yr. unknown. Highest Productivity in Passenger Sales (MAA), 1996-1997. Most Productivity agent International Passenger Sales (MAA), 1997-1998. Most Productivity agent International Passenger Sales(MAA), 1998-1999. Second most Productivity agent International Passenger Sales (MAA), 1999-2000. Top Passenger Agent Award, 1995-1996. Top Passenger Agent Award, 1996-1997. Top Passenger Agent Award, 1997-1998. Top Passenger Agent Award, 1999-2000. Top Passenger Agent Award, Yr. Unknown. In spite of success, STIC has not forgotten its responsibility to society. And in keeping with this, STIC has floated a charitable trust called ‘The Awakening’. STIC organized a concert to raise funds for the Shanti Avedna Ashram - a hospice for terminally ill Cancer Patients. STIC collected approximately 100,000 Indian Rupees as a result of the concert, which were donated to the hospice. 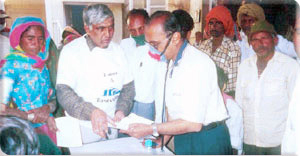 Contributions worth Rs.500,000/- were collected and distributed across the state of Gujarat in February 2001 for the re-habilitation of the victims of the devastating earthquake, which hit Gujarat on 26th Jan. 2001.